With the Hall of Fame Game in the books, the 2018 NFL season has officially started. Well, at least the preseason has started. That’s something. It’s time to kick in to high gear as fantasy draft season will be heating up in the coming weeks. It may seem like a very simple statement (not one I came up with but do adhere to) but I feel like it’s worth mentioning before every fantasy season kicks off — drafting a successful fantasy line up is all about maximizing value and minimizing risk. One risky reach, especially in the early rounds, can derail a draft quickly leaving an owner scrambling to recover. There are a handful of players that I feel are being selected sooner than they should that would fall into that risk category — the downside, for me, outweighs the upside at their draft slot. Let’s take a look at some “Buyer Beware” players heading into the 2018 season. It’s risky to trust a quarterback coming off of a shoulder injury that had him miss an entire season. It’s even riskier to trust that quarterback playing behind a shaky offensive line. In his four and a half seasons (he missed nine games in 2015), Luck has been sacked 156 times. Last season the Colts allowed a league-high 56 sacks as well as 156 quarterback hurries and 36 hits. This feels like a “one hit away” situation that could leave fantasy owners relying on their backup quarterback. After leading the 49ers to five straight wins to close out the 2017 season, Garoppolo has seen his hype train chugging along at full speed. According to current ADP numbers, Garoppolo is the ninth quarterback coming off the board, making him a QB1 in both 10- and 12-team leagues. That seems a bit high considering the small sample size of production we’ve seen from Garoppolo. In those five starts he put up seven total touchdowns (one rushing) and five interceptions. 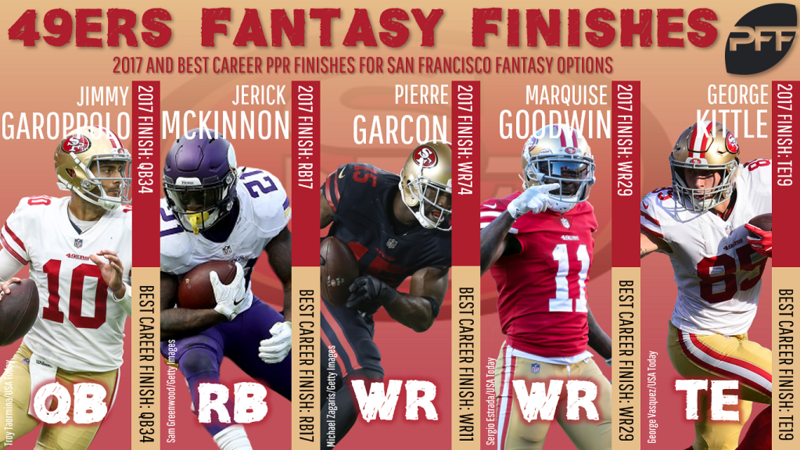 The receiving options are a bit suspect as well being led by 31-year-old Pierre Garcon and unproven tight end George Kittle. Early reports out of Chiefs training camp seem to indicate that Mahomes has been struggling with interceptions. That’s not really a surprise for a young quarterback stepping into a starting role but it’s not very encouraging either. In his lone start last season in Week 17, Mahomes did lead the Chiefs to a win but failed to throw a touchdown and had one interception. Mahomes is currently a very nice dynasty draft selection but it’s too risky to rely on an inexperienced starter in redraft formats. The fantasy love for McKinnon since he signed with the 49ers has been strong. According to current ADP he is the 14th running back being selected. That is a bit high for a player who has never finished higher than 24th in fantasy scoring in a PPR format. It’s hard to imagine that McKinnon has the chops to be a three-down bell-cow back for San Francisco when he’s averaged just 3.4 and 3.8 yards per carry over the last two seasons, respectively. Also keep in mind that Matt Breida averaged 11 touches in the five games Jimmy Garoppolo started. There are very few absolutes in life but one I live by is to never trust the Patriots when it comes to their usage of running backs for fantasy purposes. Michel was selected in the first round (the first time New England has done such a thing since 2006) but is joining a crowded backfield and will be part of a committee approach. Rex Burkhead and James White combined for 193 touches last season with 11 touchdowns. Ball security issues have been an issue for Michel and could land him in Bill Belichick’s dog house should they continue. There are a few factors working against the rookie running back being a fantasy force in 2018. First of all, Chris Carson is currently running as the lead back in Seattle, having returned to health from the ankle/leg injury that he suffered last season. There is also the fact that Penny was not much of a threat in the passing game while at San Diego State, hauling in just 42 passes in 51 games. Finally, the Seattle offensive line struggled to run block last season and doesn’t appear to be much better heading into 2018. Seattle averaged 0.63 yards (10th-least in the league) before contact on outside zone runs, which was nearly half of the league average of 1.21. With a current ADP as the 22nd receiver off the board, Gordon would be sitting as a WR2 in 12-team formats. That’s a bit high considering that Gordon has played merely 10 games since 2013 and is one misstep away from being out of the league again. I’m a “glass half full” sort of guy and wish nothing but the best for Gordon, but his current break from the team makes me more than a bit concerned. There is also the addition of Jarvis Landry to the receiving corps to eat into possible targets as well as tight end David Njoku (60 targets in 2017) and running back Duke Johnson (93 targets). This isn’t an indictment on Baldwin’s ability, as he’s put up top-10 numbers in PPR scoring in two of the past three seasons. It’s the recent reports out of Seattle that Baldwin could miss the entire preseason with a sore knee. It is a huge red flag when terms such as “hopeful” are being bantered about as to whether Baldwin will be good to go for Week 1. It’s advisable to let another owner take the risk that this is a lingering issue that limits Baldwin all season long. It’s the same as it ever was concerning Reed’s fantasy relevance. Can he finally stay healthy? If the past is any indication, then the answer is a resounding “no.” Entering his sixth season, Reed has managed to play 12 or more games just twice. In those seasons Reed finished as a top-10 fantasy option; in the other four he missed a combined 22 games with myriad injuries including concussions, MCL strains, ankle strains, thumb strains, and multiple toe surgeries. In fact, Reed is coming off another toe surgery heading into the 2018 season. The risk factor should have fantasy owners looking elsewhere for TE production. There is every chance that Doyle could put up his third consecutive top-12 scoring performance at tight ends. There is also the possibility that free agent signee Eric Ebron could eat significantly into his target total. Ebron was not signed for his blocking skills — which are lacking — but to be another weapon for the returning Andrew Luck. Last season Doyle saw 107 targets with the next closest tight end Brandon Williams seeing just 17. There is no chance that Ebron will see just 17 targets in 2018.